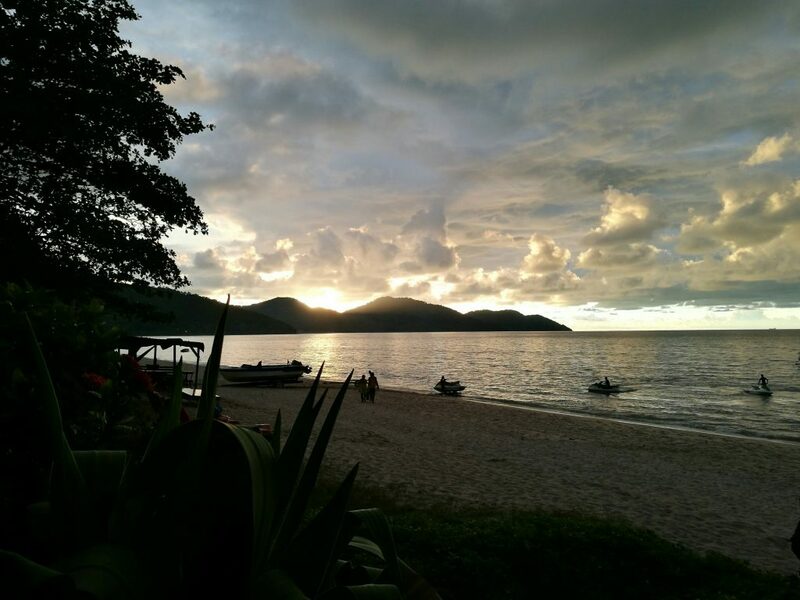 Before we started this round of our travels, we’d decided that we were going to make our visit to Malaysia more of a ‘beach break’ than another marathon week of sight-seeing. 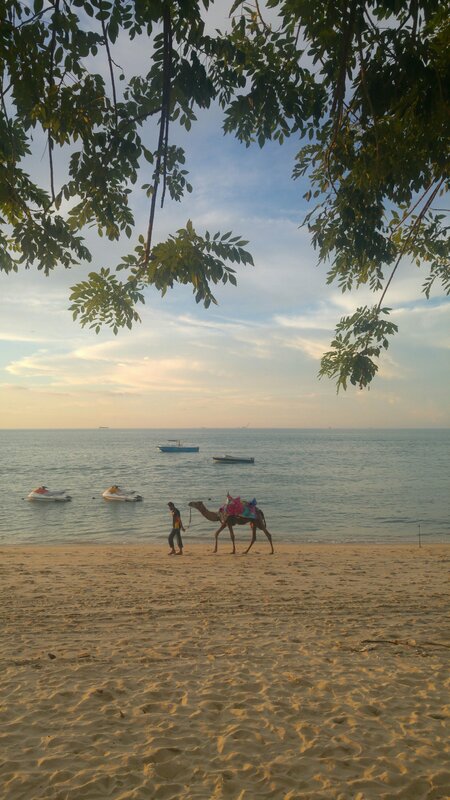 So before we even arrived in Penang, we were already feeling pretty chilled and relaxed. The flights from Sydney to Singapore and then Singapore to Penang were uneventful and our pre-booked taxi was already waiting to take us to our hotel. We’d done a bit of research beforehand about the best way to get to the hotel and good old TripAdvisor reviews led us to Ocean Jupiter. We knew how much we were going to have to fork out for the journey before we got in the taxi we had no worries about being ripped off and our driver was brilliant. He took us the scenic route (having checked with us first) and pointed out all sorts of places of interest. Our own private sightseeing tour of the island, in a nutshell! 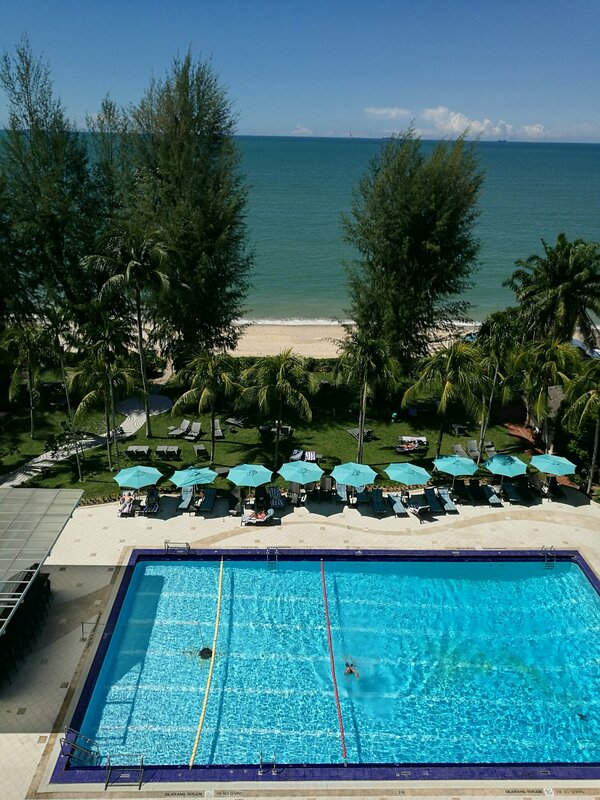 Our hotel was The Holiday Inn Resort Penang and what a spectacular view we had from our room on the 7th floor of The Beach Wing. 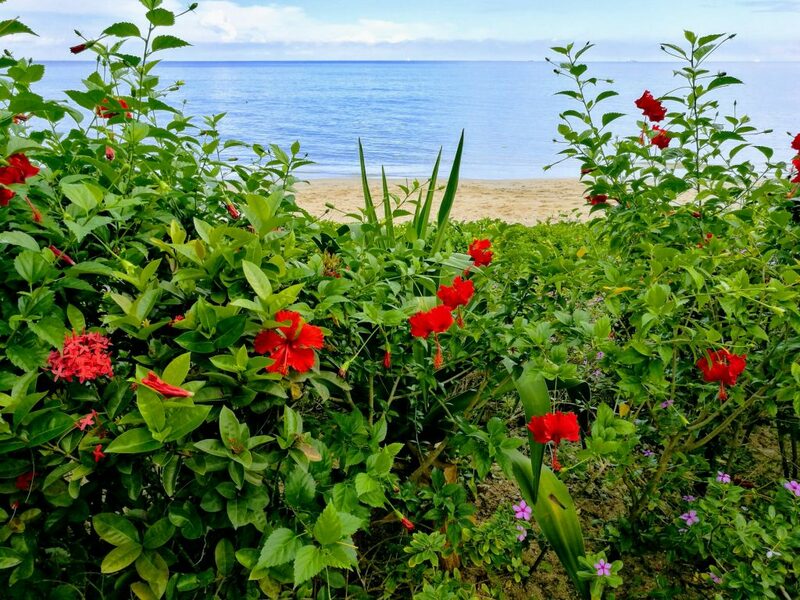 A sea-view is always the icing on the cake for me as every morning when you wake up, you’re reminded how lucky you are! The balcony outside our bedroom had sunbeds, a parasol and all the necessary widgeamawotsits so we didn’t even need to leave our room unless we wanted to. A nice thing about this hotel though was that there were no ‘sunbed wars’ to speak of. There were more than enough to go around for anyone who wanted one, whether poolside or looking out over the ocean. Now before I go any further, I have to mention the weather. We had a couple of showers but for me they were a welcome relief as they seemed to clear the air and freshen things up a bit. 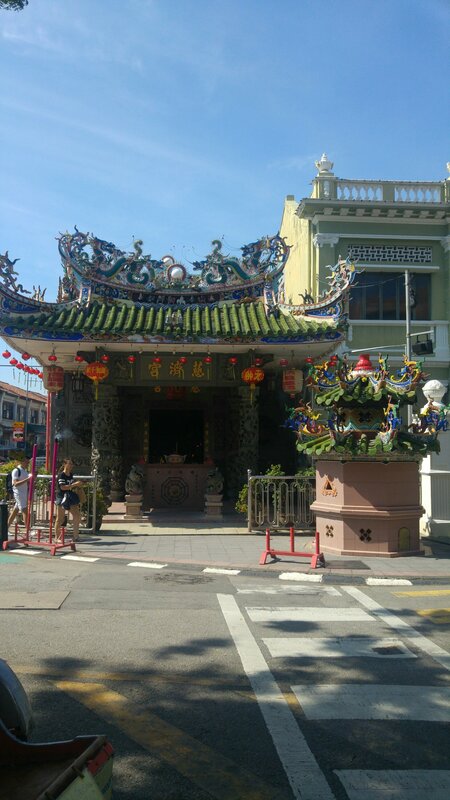 Penang is without doubt very hot but for me it was the humidity I found difficult to handle. I know I’m a lady of a certain age and all that and it doesn’t take a lot to bring on a ‘personal summer’ but my hair and face felt permanently damp. I actually envied Mr. C and his shaved bonce! Fortunately I don’t tend to wear much make-up on holidays anyway, because here it would have just slid off my ‘glowing’’ face straightaway. Our hotel was next to a very lively Night Street Market with food to suit every taste and nationality and boy was it cheap. One night I had a Pad Thai cooked fresh in front of me and only paid 6 Ringgits for it! Running the gauntlet of the hawkers selling handbags and watches (‘genuine copies’ they called them – noone says ‘fake’ here!) and other trinkets was fun usually but wearing on occasions. I even bought myself a ‘genuine copy’ Jimmy Choo bag as I’d had to leave my ‘plane’ handbag in Australia with a broken zip. I just wanted a bag big enough for my Kindle, purse, phone and all the necessary paraphernalia we ladies take on planes with us. It struck me that even if I picked up a cheapish bag in New Look or somewhere similar at home it would cost me way more, so I had nothing to lose.Mr. C bartered the price down to about half of the original starting price so all in all we walked away feeling pretty pleased with ourselves. We mainly ate from street hawkers in Penang but the vast Breakfast Buffet in our hotel meant we were pretty much set up for the day anyway. We treated ourselves one night to a North Indian Banquet in the Holiday Inn Terrace restaurant. Very good and incredibly filling! A visit to Georgetown has to be on the agenda if you’re in Penang. Charles and Camilla were there the same time as us, though unsurprisingly we didn’t bump into them on our travels. We did the Hop On, Hop Off Bus Tour which gave us a potted history of the place and kept us cool and air-conditioned for some time. 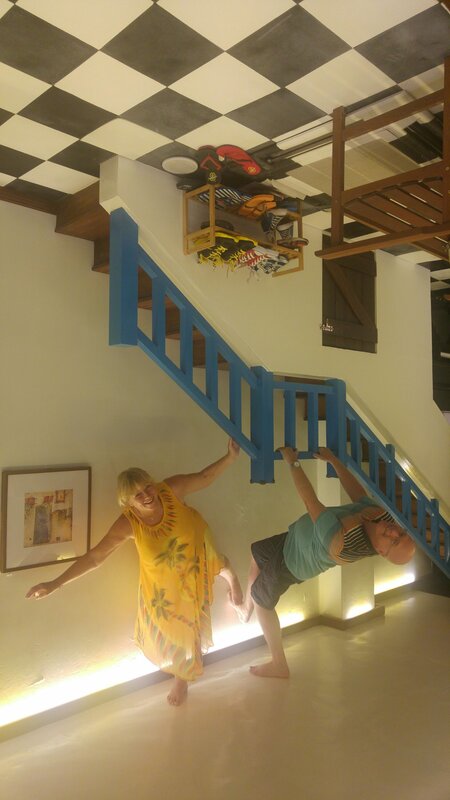 The Upsidedown Museum was a good laugh and it was lovely to see families of all hues and nationalities giggling and laughing hysterically in the various upside-down rooms. Perhaps Mr. Trump should pay the place a visit so he can see that people are all people. We’re all the same and we laugh and cry at pretty much the same things. Local buses in Penang are the way to go if you’re travelling by the way as they are sooooo cheap. It cost us 2 Ringgits to get from Georgetown back to our hotel and the buses are regular and always seem to go to time. UK bus companies take note! 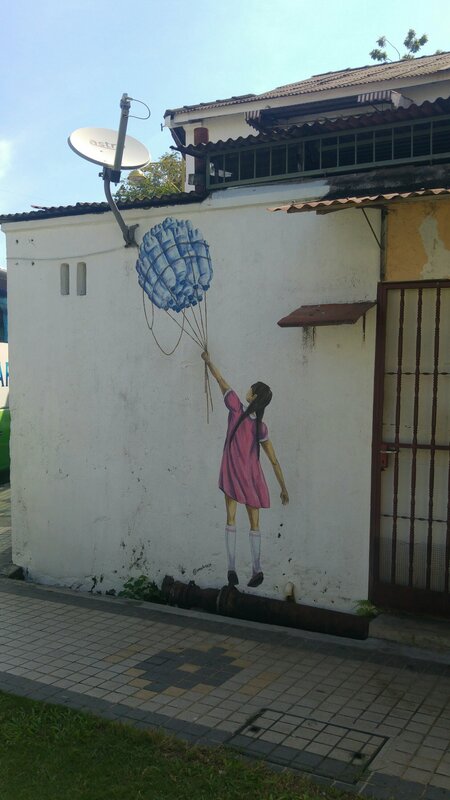 So Penang, would I recommend a visit there? Humidity aside, yes I would. It’s genuine, it’s chilled and it’s cheap!